Here’s a little puzzle for you, if you decide to play along. I will tell you the details of a little project, revealing most of them in documentary-pictorial format, and you tell me at what point you figure out what I’m making! It took me about 1-2 hours to complete this project. Even though I didn’t use any yarn, I could have done so. Contenders: Euroflax linen and Elsebeth Lavold Hempathy. I could have also substituted canvas or burlap. So, at what point did you guess what I was making? I bet some of those look familiar… The red ones all the way on the left? (out of focus in these shots, I know) The purple ones in the top row and the black ones all the way at the bottom? Nicely done! 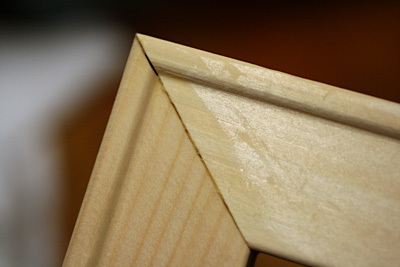 I didn’t guess your exact intent until the first photo of the completed object, though the stretchers were a giveaway to me that you were building a canvas, and the leveler told me you’d be hanging it on the wall. This was a fun post. I was too convinced about the picture frame/canvas idea, to let any other options enter my braincells. Seems we share a similar taste in ear rings. 🙂 I don’t like wearing studs, but will wear anything dangly and sparkly! I am constantly thinking how I should store/display my jewellry. I’m looking for a jewellry tree, where to hang my necklaces and earrings (i have no bracelets remarkably). Your idea is really clever! Very clever! 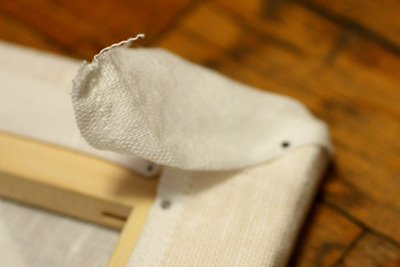 Are the holes in the linen big enough to place the wires through easily? I’ve seen commercial wire mesh versions…yours is more attractive. I thought maybe you were going to do some embroidery! The earring holder is much more practical. It looks great & such a fabulous idea. I need one too for my earrings. Thanks for the tutorial. Nice! I knew what it was right away, because I made one myself last year! Except, I used cross-stitch fabric instead of a linen dishcloth. Nicely done! And I seriously covet your earrings. I am a big fan of the dangly sparkly earrings myself. I really should make something like this too – all mine are jumbled up in little boxes right now. That’s awesome! I need to make something like that — my earrings are all piled up in a little glass dish in my bathroom. Awesome! One day, when I no longer have to live in squalor (ie. hav finished gradschool and live like a grown-up) I’ll make one of these too! Great idea! I didn’t guess until I saw the earrings. I’ve mildly though about making a light box with stretcher strips, so my ideas couldn’t get past that point. 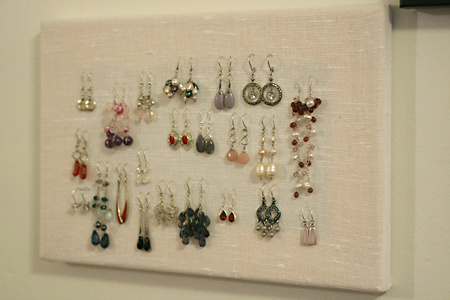 I have a similar setup for my earrings and it’s such a great way to keep them organized. 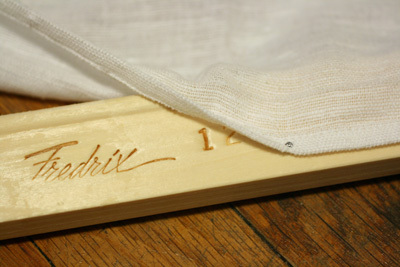 I used canvas stretcher bars and needlepoint canvas to make mine, but I love your dishcloth method. Thanks, I needed that! I moved and lost my earring hanger in the process. It was the only thing really that got broken, and I had to give up on it. This might just work. I used to make those at my first job (New York Fabrics) – they covered the walls with them. I still have some of my old fabric stash, too, come to think of it. That is too cool. I will have to jerry-rig something like this for my necklaces, too. Thanks for sharing! Call me dense. I didn’t figure it out until you showed the completed object hanging on the wall complete with earrings. Great idea! Oh those are so fun to have around! My brother made one comparable to that but he used window screen instead of the linen cloth. Very pretty earrings indeed! Wow I am slow it took me until I saw the earrings to figure it out but I love the idea! Beautiful job. Useful, too! I thought at first you were building a hammock (though not for long). I guessed a canvas to paint on, but after the reveal I am making one ASAP. You have fabulous taste in earrings! All I can think about are where did she get those? Hah, I made canvasses all through art school and was completely flummoxed by your description (it has been a long morning). 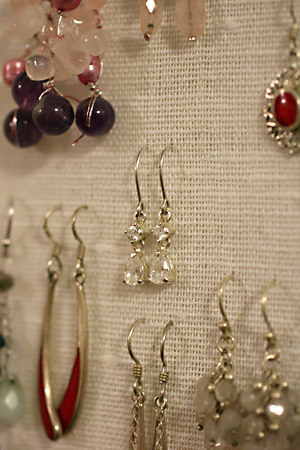 What a great idea for displaying earrings! I have been pondering that problem for myself, though I was considering wire mesh. 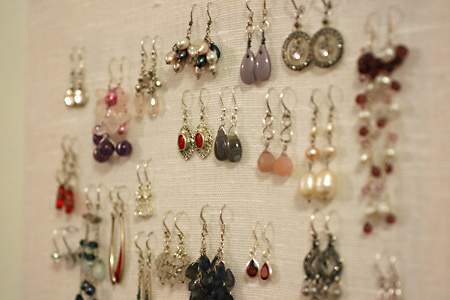 And what a great collection of earrings! I’ve seen a lot of these. I had a suspicion when you said you could have used linine/hemp yarn, and had a pretty good idea when you mentioned the stretcher strips and the dishtowel. cool! i figured it out as soon as i saw that the napkin was going onto the frame. i said, ‘ooh, earring holder!’ it looks great! That is amazingly beautiful! I bet you could even put in some glass head pins and add your nicest stitch markers, too! You’re so crafty! I figured it was some kind of canvas, but I wasn’t sure what you were going to use it for. Very nicely done! The lady at The Adventure House (where I house-sat for the summer last year) had made one of those out of an embroidery hoop and some pretty fabric. I never did figure out what you were making though! Very nice! I made a similar one using some lace and a Goodwill frame. Just stapled the lace to the back and cut away the excess. Fun! You are much smarter than I! 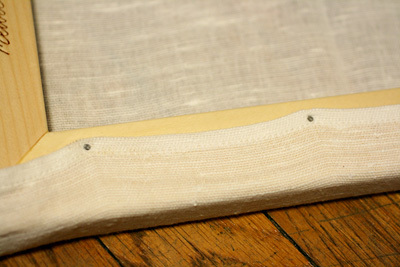 I made this same thing, but I used a pre-made frame and some cheesecloth-like mesh. Needless to say the mesh didn’t last long with some of my heavier earrings. 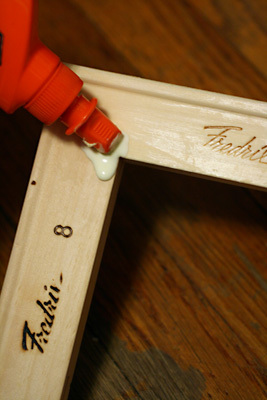 I was becoming convinced you were making some sort of wall mounted yarn holder… lol! aaahh, you crafty girl, you never disappoint! What a great idea! I bet my girls would love to have something like that hanging in their room for their earrings! Unbelievable. Just YESTERDAY I was sorting my jewelry ‘drawer’ and thinking why in the heck can’t I come up with a better way to organize my earrings than having them in little piles here and there always tangling and hard to see and find and frustrating me endlessly. What a terrifically lovely solution, which I never would have thought of in a million years but that I will shamelessly copy asap! Thanks you so very much. I didn’t guess the final purpose. But did guess you were framing the cloth for something. Great idea. It will also look nice wherever you hang it. 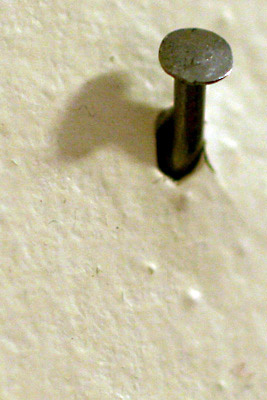 Love it.To take care of other jewelry you can screw some hooks into the bottom of the frame to hang necklaces and bracelets from…or how ’bout covering a length of pine board same length as frame with same fabric,cup hooks into board; screw eyes in bottom of frame and top of board and then connect with lengths of chain (or hang with separate picture frame hanger). I have played around with the idea but haven’t actually done it yet; too many ideas and not enough time. What would you have done with the yarn, if you’d gone the yarn route? I have something similar. I bought an inexpensive picture frame, removed the glass and used a staple gun to attach chicken wire on the back so that the earring hang from the holes in the chicken wire. 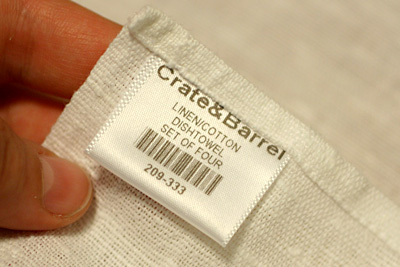 I like the linen — you could paint it! I have to tell you I guessed at the ingredients list! I try to to think outside the box, and that seemed to be what you were hinting at. I also saw one made using screening for doors- some of which were painted (florels etc). Pretty cool. I have my earrings hanging on a wire lattice plant support. I thought immediately that you were stretching the towel on the canvas stretchers – I didn’t know you were going to organize earrings…. So I didn’t guess until the end…but I’m glad you bought that towel at Crate…I’m the CS manager in the West Hartford Ct store! Thanks!! Very nice project, but couldn’t you stretch a piece of knitting to hang earrings from? What could you do for necklaces? Knit lots of bobbles to hang them from? Nicely made but mine was even easier… Take an old crochet doily and mount it in a slightly smaller embroidery frame (the Evil W store has plastic ones in colors even). 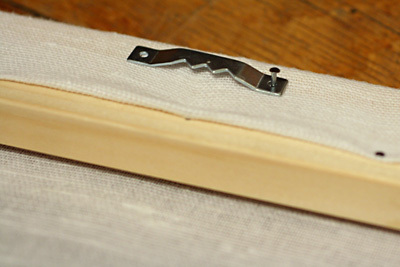 Thread a ribbon (contrasting or coordinating color) through the adjustment mechanism and hang from cut little picture nail. Voila! And for those of us who can’t nail worth a damn, easily accomplished.